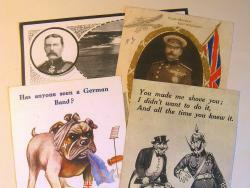 Copies of 4 original, period, patriotically-themed postcards. Two featuring Field Marshall Earl Kitchener, and two with humerous anti-German sentiments. Full colour with blank reverses.